We have reached the final week of the regular season, with our swimmers preparing for Monday’s state meet and our basketball teams both anticipating hosting games in next week’s state tournament. The boys swim team (third) and girls swim team (fourth) had strong showings in Thursday’s conference meet. Both basketball teams will close out the regular season Friday at North Raleigh Christian on win streaks. The girls have won three in a row to raise their record above .500, while the boys have won 10 straight and set a school record with their 26th win on Tuesday night. Both the boys and girls swim teams had successful finishes at Thursday’s Triangle Independent Schools Athletic Conference meet in Cary. The boys finished third, while the girls placed fourth in the meet. 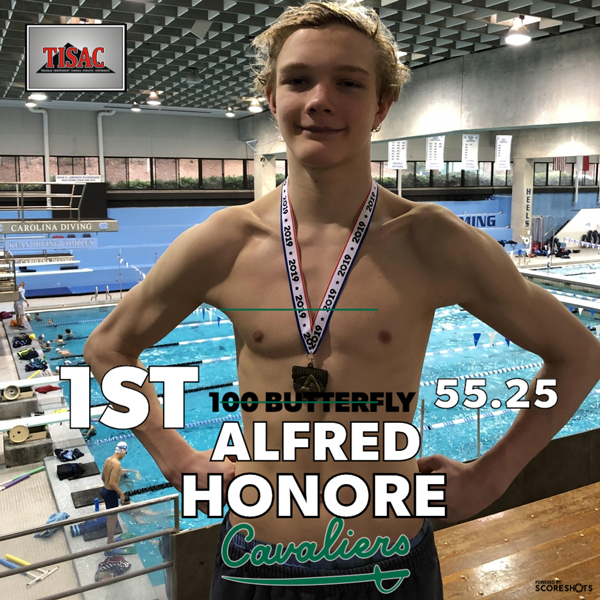 Ninth-grader Alfred Honore had the lone first-place finish for the Cavs, with his victory in the 100 butterfly. Ninth-grader Stewart Roessler had a third-place finish in the 500 freestyle and placed fourth in the 100 backstroke. Roessler and Honore were both members of two third-place relay teams. The ninth-grade duo joined with senior Nathan Dalva-Baird and eighth-grader Brodie Mason in the 200 medley relay, while Dalva-Baird, Honore and Roessler were joined by ninth-grader Lars Oehler in the 400 freestyle relay. Dalva-Baird took home fourth place in the 100 breaststroke, while Oehler was the fifth-place finisher in the 200 freestyle race. On the girls side, the fourth-place Cavaliers were led by eighth-grader Spencer Jennings’ four third-place finishes. Jennings teamed with senior Haley Leversedge, sophomore Quinn Shanahan and seventh-grader Maya Dolan to reset the school record in the 400 freestyle relay. This is the fourth time this season that the 400 free relay school record was broken. This same quartet also finished third in the 200 medley relay. Jennings swam to third-place finishes in both the 100 freestyle and the 100 backstroke. The 200 freestyle relay team of junior Lauren Grosshandler, sophomore Anna Brent-Levenstein, eighth-grader Meghan Phu and seventh-grader Charlotte Norman placed fourth in their event. Phu (fifth) and Grosshandler (eighth) also placed in the top 10 in the 50 freestyle. Combined, the DA swim team will send 24 swimmers to the state meet on Monday in Greensboro. Full coverage of the meet will appear in next week’s Cavs Corner! The girls basketball team heads into Friday's regular-season finale at North Raleigh Christian having won three in a row and with a chance to claim a share of third place in the final TISAC standings. Imani Spence celebrated her senior night in a big way; her 19 points, career-high 20 rebounds and eight steals lifted the Cavs to a 50–43 win over Wake Christian on Tuesday. Spence and her teammates stormed out to a 15–2 lead after one period and were able to hang on for the conference victory. Eighth-grader Joelle Davis contributed 12 points, while sophomore Amelia Kass added 8. In the Jan. 31 36–33 home win over Saint Mary’s School, the DA girls had to rally from an early deficit to defeat a Saints team that earned a win over the Cavs just eight days prior. Spence had 17 points, nine rebounds and seven steals, as DA rallied from 3 points down after three quarters for the win. It was a Davis 3-pointer followed by a Spence steal and two free throws in the final minute that put the Cavs on top. Davis had 9 points for the Cavs. The DA girls will have a tall task on Friday night against the TISAC champion Knights. The Cavs will find out the date of their first-round playoff game on Sunday evening after the seeding committee meets in Greensboro. It is anticipated that DA will host a game either Tuesday or Thursday. The boys basketball team broke the school record for wins in a season by taking the squad’s 26th victory in Tuesday night’s 93–52 win over Wake Christian. It had been 15 years since a DA boys team scored 90 points, and this year’s Cavaliers squad has done it four times. Seniors Bryant Randleman and Michael Savarino celebrated their senior night by combining to shoot 14–19 from the field with nine assists. Randleman led the Cavs with 18 points, while Savarino and sophomore Cole Sinclair each added 16. The Cavs built a 48–22 halftime lead, thanks in part to shooting 61 percent from the field and committing zero turnovers. Junior Davis Beischer, sophomore Brent Randleman and ninth-grader MJ Rice all added 9 points, while ninth-grader Nik Graves contributed 7 points and five assists. The win follows Friday night’s 79–29 win over the Raleigh Hawks. Rice led the Cavs with 13 points, seven rebounds, three assists and three steals, while Savarino was 4–4 from the field and finished with 12 points. Sinclair hit three 3-pointers to break the school’s single-season mark. His current total of 89 places Sinclair 64th nationally and sixth in the state according to MaxPreps. The DA boys were balanced — for the first time all season, all 12 Cavaliers scored and had at least one rebound. The Cavs continue to be ranked 10th in the HighSchoolOT Eastern North Carolina poll, fifth in the Phenom Hoop Report’s private school poll and third in most NCISAA 4A rankings. A win in Friday’s regular-season finale would mean at least a share of the TISAC championship and a probable top-four seed in next week’s state tournament. The most likely scenario would have the DA boys hosting a quarterfinal game on Saturday, Feb. 16. Please check our website and social media outlets on Sunday evening to see the brackets for both the girls and boys basketball state tournaments, which begin next week. We will also have coverage of Monday’s state swim meet from Greensboro. Thank you as always for your support of DA athletics!